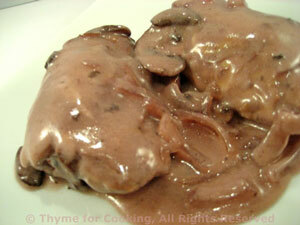 Chicken Thighs, Red Wine, Mushrooms, Thyme for Cooking main course. Skin the thighs, if you like, but leave the bone. These are braised in a savory red wine sauce with mushrooms and onions. Skin the thighs by simply pulling it off. You may need to cut in a few places. Discard skin. Add chicken thighs and brown on both sides, about 5 minutes. Add mushrooms, onion and sauté 5 minutes longer. Add stock, wine, thyme and stir to combine. Turn the thighs once or twice to coat with sauce. Cover, reduce heat and simmer 15 minutes. Remove thighs to a small platter. Dissolve cornstarch in water. Increase heat under sauce, add cornstarch and stir until thickened and clear. Stir in yogurt. Spoon sauce over chicken thighs and serve.